Hey there. I'm not a huge baseball fan. I just can't watch it and enjoy it on TV. I don't mind playing it though. 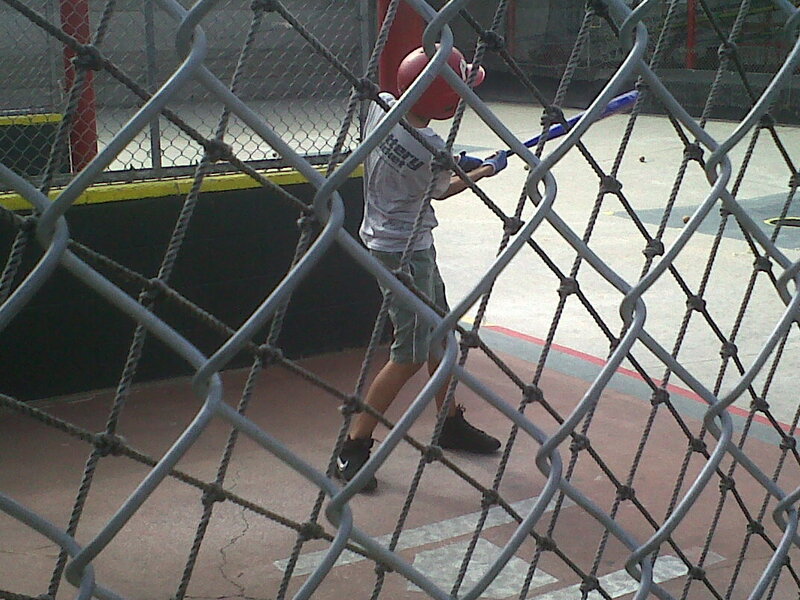 Yesterday, my brother decided that he wanted to take my son to the batting cages. Sure, why not? The boy likes basketball and football but has not been exposed to much baseball so maybe this outing will spark an interest in the sport. 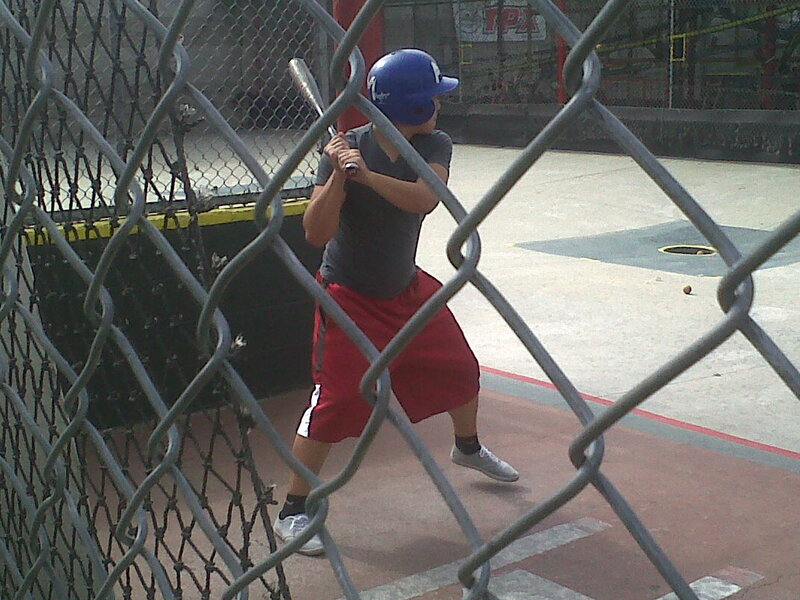 So I go pick up my brother and our cousin wanted to come along so the four of us are off the batting cages. We went to the All Star Park batting cages in Bellflower. Not a bad spot at all. Being my first time there, I didn't know how much this would run me or what kind of equipment I needed. We took some bats and batting gloves just in case. When we asked the clerk how much, he said it was $35 for a full hour, unlimited pitches (11 at a time), free bat rental, and helmet rental. And the best part was that we all could take turns and get as many pitches as we could get for that hour. Not bad. Not bad at all. 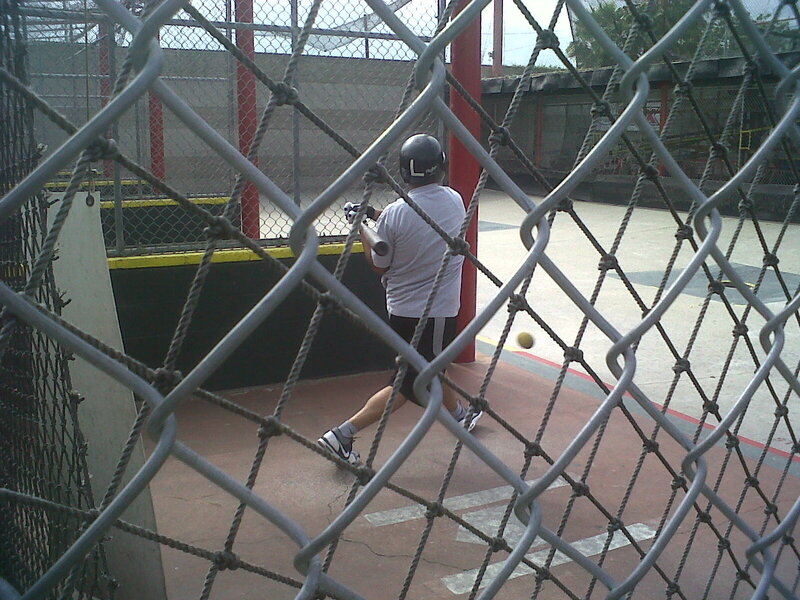 I'm an awful hitter so I missed... and I missed a lot. But that's alright because as the hour went on, my swing got better. Not to mention my son's swing as well. He doesn't have the upper body strength that we have so his swing was a little on the slow side as the hour went on, you could tell that fatigue was setting in. However, when I asked him if he wanted to sit a round or two out, he refused. We all told him that it's going to build some muscle on that small frame of his and that it showed good character to keep on swinging. By the end, he definitely had a good time and asked if we could go back some time soon. Awesome. We left the cages saying how we all haven't been there in years, or never been there before at all. This morning, my boy comes to me and says that his arms are sore. lol Mine are too. I'm surprised that his hands are not aching a bit. My palm and forearm are a little sore and I'm sure it's because I was using muscles I've never used before. Perfect form! Too bad I missed it! My brother the loser! Swing and a miss! hahahaha! Where's the dingers you promised the boy? My boy! 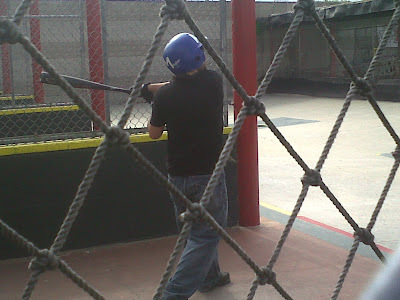 Taking a swing! You can do it, boy! Even though baseball is not the sport for me, it could be for my boy. Nevertheless, I wouldn't mind going back to take some more swings. If anything, it'll work out some of those muscles that I don't use and will better my hand eye coordination. We all had a good time so I wouldn't mind heading back there with the same line up. lol Until then, later!